I feel like I need to get that out there when I discuss her behaviour at times. She is an amazing kid when she’s in situations where she’s expected to be just that, a kid. When we put our otherwise perfectly behaved two-year-old in situations where we expect her to suddenly act like an adult and different from the free spirt she usually is, we’re (surprise, surprise) often faced with backlash. Two is a bit of an awkward age. She knows and understands so much about her world. She talks to me and has opinions about things yet she doesn’t exactly know how to control herself all the time. She gets frustrated sometimes and isn’t quite at the age of being able to tell me exactly what’s going on. She doesn’t understand why we’re always telling her she has to walk (and that we’re not carrying her) but that when in the grocery store we won’t let her walk freely as we do 97% of the time and thus can have mini freak-outs about being contained to the cart. 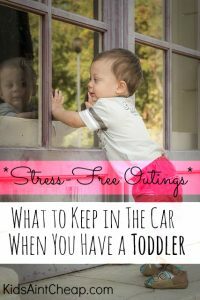 Getting anything done with a toddler can be an experience but with a few preparations it doesn’t always have to be a stress-filled outing. I’ve never met a kid who didn’t like to eat. My daughter will do just about anything for food. I don’t leave the house without a purse full of snacks. I especially prefer things there are multiple of, things that take longer to eat than just one cracker sort of thing. I like stuff like dry cereal, raisins, fresh fruit cut up, cheese cubed and popcorn. Unlike adults who throw foods by the handful in their mouth, a toddler will each the popcorn one kernel at a time which, in turn buys you time to get your errand done! I also have books when we go out, there are a few books that live in our vehicle so I’m not looking for them every day. Specifically I like look and find picture books with busy pages so we can talk about multiple things without getting bored (think: show me something red, where are the balloons, what is the boy holding). The types of books that can elicit a lot of different conversations are the best. Never bring books with removable parts because they will get lost. This goes without saying but make sure you always have extra diapers, wipes, potty’s and a change of clothes. I can’t very well expect much in terms of behaviour when she needs the bathroom but still scared of public washrooms, or spills a drink all down her shirt and now uncomfortable. Sometimes managing the basics are all we need. We love our little balls of energy but sometimes when we need to get stuff done they can be a little difficult to deal with! 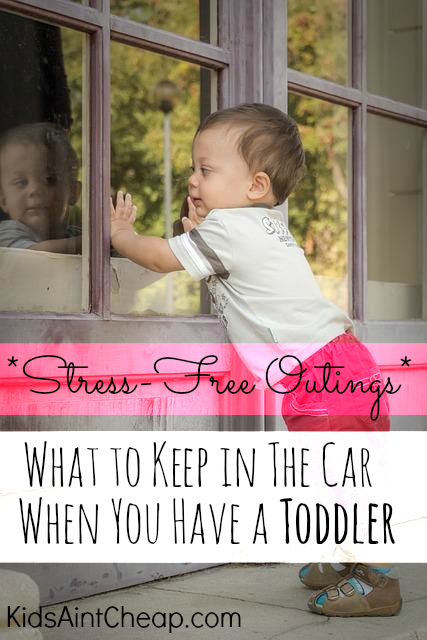 Though it sometimes takes a little additional planning when leaving the house for an extended period of time, having distraction vices for the kiddo can be a life saver! What are your favorite way to keep kiddo occupied while out and about?